Frigid weather in the United States has left the ocean frozen in a number of states, allowing people to break out their ice skates. Footage from YouTube that has gone viral shows one man ice-skating next to the frozen ocean at Long Sands Beach in Maine. Temperatures across the nation have dropped to record lows, including minus 35 degrees Fahrenheit in Massachusetts, minus 45 degrees Fahrenheit in Maine, and minus 50 degrees Fahrenheit in parts of Vermont, reported Boston.com, citing the National Weather Service. Peter Lekousi captured the man ice-skating in Maine while he and his wife were strolling along the beach and posted the footage online. “I keep trying to tell you all, every day is a beach day in Maine,” he wrote on Facebook. 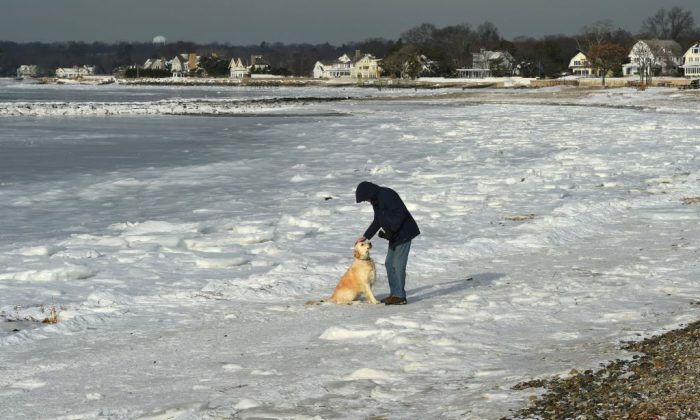 Demonstrating further how frigid it has been, the waters hugging the northern Massachusetts coast were frozen enough to carry the weight of several people who ventured out to take pictures and videos. Ryan Canty shared his drone footage of the spectacular sight, with it being shared widely. Around 100 million people in the United States were affected by the “bomb cyclone,” reported The Associated Press. Some people opted to stay home instead of dealing with the painfully cold air, while others were forced to do so after more than a foot of snow dropped in some areas. “My car felt like an icebox this morning, even though I had the heat on full blast,” Julie Williams, who works at a supermarket, told AP.